These Air Compressors Are Ideal For A Multitude Of Small Business Uses Including Borewell, Chemical Industries, Circuit Breaking, Spray Painting, Graniting & Cleaning, Pneumatic Tools, Liquid Transfer Etc. Size of Receiver 10" X 28"
Single Stage Air Compressor also has two pistons for pumping air; first piston compresses air and sends it into the second storage tank, or cylinder, where compressed air is stored for future use. 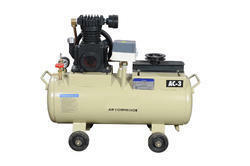 Single Stage Air Compressor is either powered by electricity or gas. The electricity powered Two Stage Air Compressors are user-friendly and, thus more common. On the contrary, the Gas powered compressors can be used when there is lack of electricity or in areas where it is hard to use electricity. 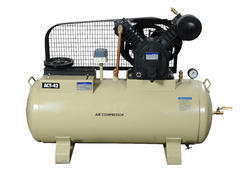 The Single Stage Air Compressors provide power to pneumatic tools such as spray guns, ratchet wrenches and air nailers. They can be used in gas stations and various manufacturing plants. Single Stage Air Compressors are typically immobile and can be used to provide power to a range of tools for a long duration. As compared to their counterparts, Single Stage Air Compressors are more energy efficient. By utilizing more air power, they generate less heat. Also, the Two Stage Air Compressor and apparatus do not wear since heat generation is quite low. Single Stage Air Compressors produce more power than conventional electric-power generators and are also safer than other power generation systems. Single Stage Air Compressors are strong packages to be used either as a backup system in major installation or a whole air system for small industrial installations. Size of Receiver 12" X 32"
Size of Receiver 14" X 32"
Tank Size 14" X 32"
Air Receiver Size 16" X 40"
Size of Receiver 16" X 40"
Size of Receiver 18" X 42"
Size of Receiver 18" X 48"
Tank Size 18" X 48"
Size of Receiver 20" X 54"
Air Receiver Size 20" X 54"
Tank Size 20" X 54"
Tank Size 18" X 42"
Two-Stage Air Compressor also has two pistons for pumping air; first piston compresses air and sends it into the second storage tank, or cylinder, where compressed air is stored for future use. Two-Stage Air Compressor is either powered by electricity or gas. The electricity powered Two Stage Air Compressors are user-friendly and, thus more common. On the contrary, the Gas powered compressors can be used when there is lack of electricity or in areas where it is hard to use electricity. The Two Stage Air Compressors provide power to pneumatic tools such as spray guns, ratchet wrenches and air nailers. They can be used in gas stations and various manufacturing plants. Two Stage Air Compressors are typically immobile and can be used to provide power to a range of tools for a long duration. As compared to their counterparts, Two Stage Air Compressors are more energy efficient. By utilizing more air power, they generate less heat. Also, the Two Stage Air Compressor and apparatus do not wear since heat generation is quite low. Two Stage Air Compressors produce more power than conventional electric-power generators and are also safer than other power generation systems. Two-Stage Air Compressors are strong packages to be used either as a backup system in major installation or a whole air system for small industrial installations. Tank Size 18" X 58"
Size of Receiver 22" X 60"
Size of Receiver 24" X 66"